Editors Note: This blog was originally published in parts, but for the sake of continuity, I have centralized it all here in this post and removed the other pieces. I hope you enjoy this format more. I had made a lot of great strides in the world of grid chasing, thanks to a bunch of really great rovers. Alex (N7AGF) Doug (N6UA) Clayton (W5PFG) and Paul (N1PEB) had managed to knock out several of the stragglers in random places around the map that were proving difficult earlier in the fall, then Patrick (WD9EWK) got a couple for me on his way to Reno for the AMSAT symposium, and Gabe (NJ7H, now AL6D) finished out a few of my far western grid pairs on his way to Alaska for a new job. That left me with just a big hole along the DN/EN field line thru the Dakotas, and EM41 to finish out my CONUS map on Satellite. EM41 would come in due time, but figuring out how to deal with that void in the Dakotas was going to be tricky. I could wait for someone else go rove thru the area - which might take years - Or I could take matters into my own hands. I've spent months building a properly functioning remote station here in EM34 that works well enough in most directions. I'm also a fairly accomplished rover in my own right, so activating all the grids and 'working myself' was definitely going to be possible. That said, I was going to need help. 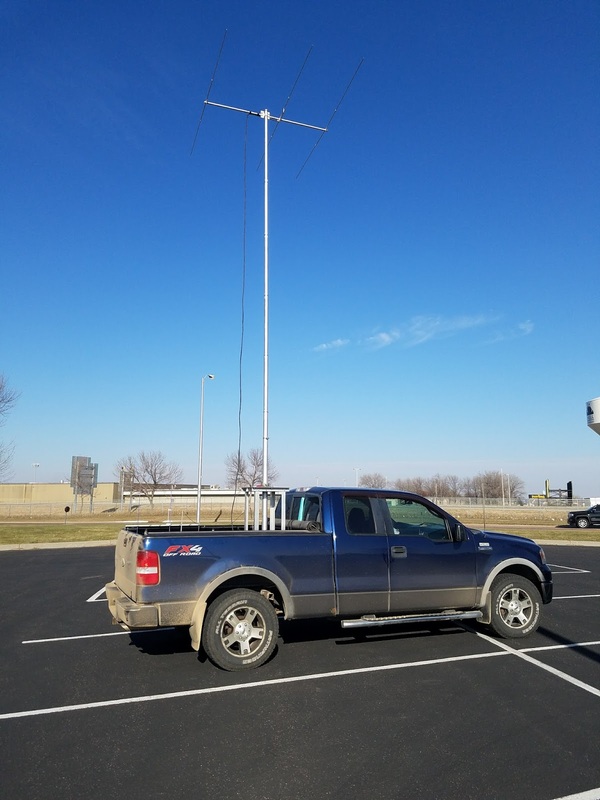 I took the idea to Wyatt, AC0RA, one of the most accomplished rovers in the AMSAT and VHF/UHF community today, and also a good friend. I discussed the possibility of roving to each of the grids I needed over the course of a couple of days, using my parent's QTH in EN21 as kind of a 'home base' due to it's relative closeness to the grids needed. He thought the idea was solid, and agreed to help - I made a map of how to navigate the highways and byways to hit all the grids needed, in the shortest amount of time possible and we had our plan. Then of course, we started adding extras. Anyone who's been following this blog has been watching my slowly growing fascination with 6m Meteor Scatter. 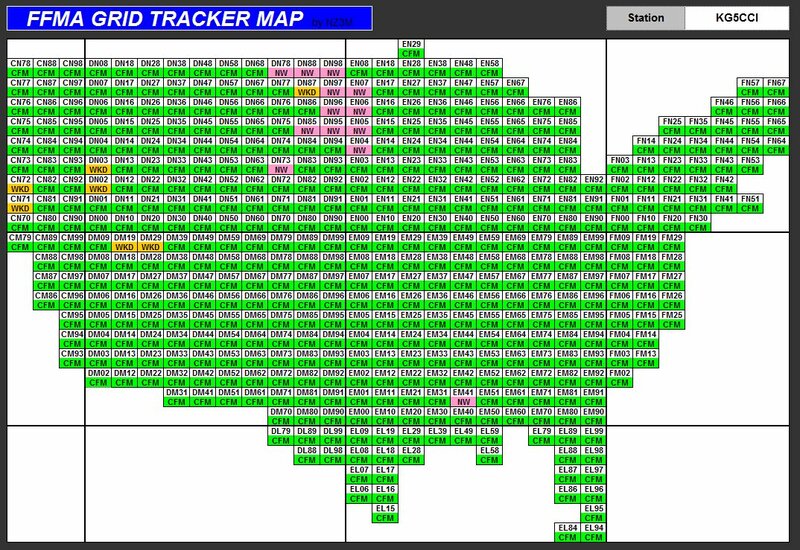 Since these grids were so rare on Satellites, it figured that some might be rare on 6m too. Well, they are. 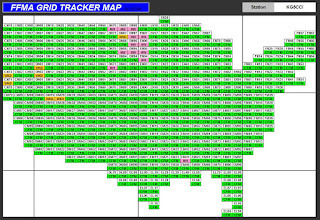 Quite a few actually are in the '3rd rarest' category (yellow) on the FFMA chaser board. Since this rove was going to occur in November, chances of e-skip were basically slim to none, but meteor scatter could work. Also a few of the local big guns in the /0 region (K0SIX especially) needed some of these grids in their final 50 for 6m FFMA. Wyatt knew this too, and suggested the possibility of taking his Rover truck with a modest 6m beam on it so we could do both Satellites and 6. As icing on the cake, since there would be 2 licensed hams in the truck we could theoretically operate in motion with 1 driver and 1 operator. This was something that Wyatt had told me he was interested in trying at some point anyway - as for contests he normally goes out solo. With that it was settled and on the morning of November 9th, 2017 we would head north from EN21 and begin a nearly 2000 mile trip to activate 13 of my 14 remaining AMSAT grids needed to complete the KG5CCI 488 map. 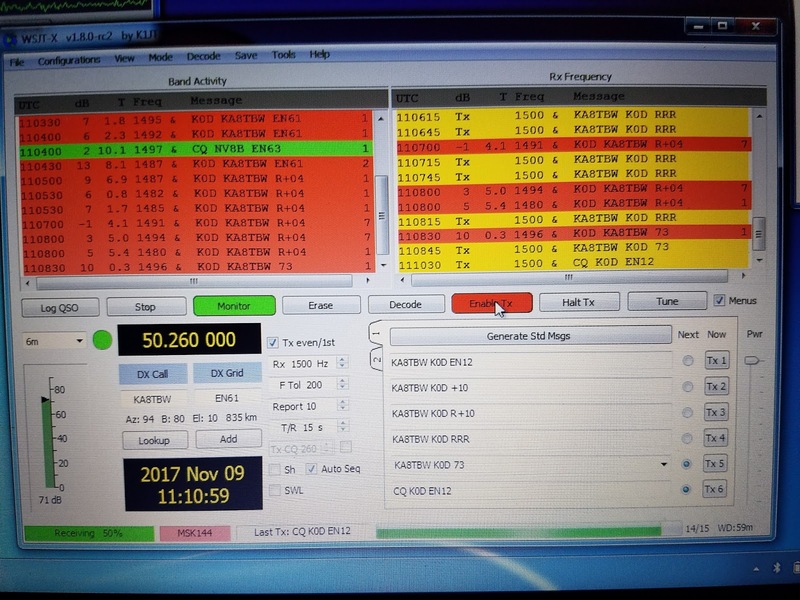 We would also operate 6 Meter MSK144 Meteor Scatter in motion, and from certain fixed locations on the rarest grid lines. I applied for the K0D 1x1 special event callsign. Since there were 2 hams, and I would be keeping my personal callsign for my Arkansas station, it would make everything easier from a logging perspective, and keep the operation on the up and up. I acquired LOTW certs, and setup a simple QRZ page with details for what we were up to. We were set for the rove. 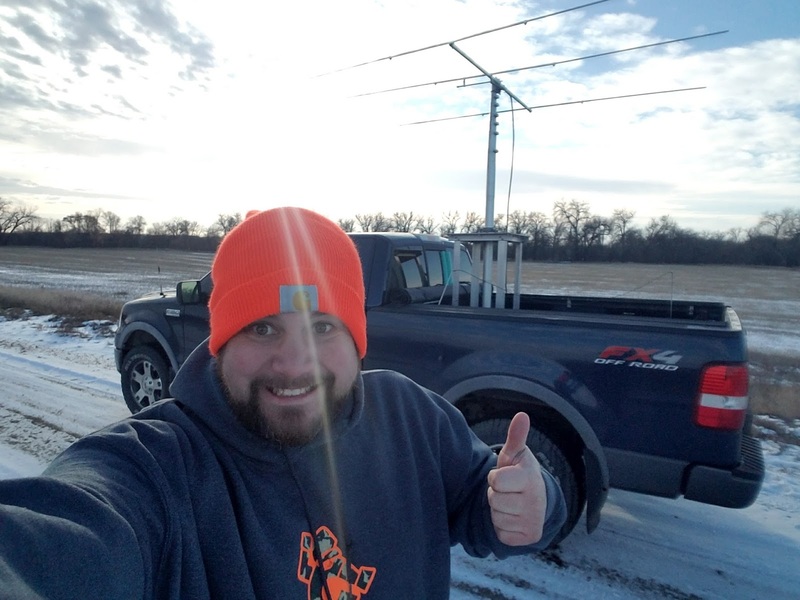 The final piece of the puzzle was how to work 'myself' since I would physically be in North Dakota with Wyatt, using the K0D callsign, and in all likelihood out in the middle of nowhere lacking cell phone reception to remote into KG5CCI myself. I was going to need more help. 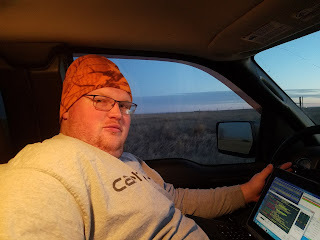 Luckily another ham friend, Clayton, W5PFG, answered the call, and agreed to operate my station remote during the passes required. We tested the station multiple times to make sure remote operation was functioning correctly, and felt like it was ready. The idea was simple enough, and the plan was set. The K0D expedition was on. It didn't take us long to get our first contact. KA8TBW was in the log at 5:08AM from EN12 while driving 75mph down I-29 south of Sioux City, IA. 8 Minutes for the contact with a 3 element beam, only 3' above the cab of the truck, and 100W from the IC-7300. The 6m in motion idea was really just secondary to the AMSAT grid activation, but already we were making contacts. We knew this was going to be a lot of fun. We kept trudging along North on I-29 until Sioux falls, where we headed west on I-90 until Mitchell, SD. We grabbed gas and a Wyatt found a baked breakfast item which he raved about being damn delicious for the rest of the trip. We busted north out of Mitchell and got to the EN03/04 line. I already had EN03 in my Satellite log from Arkansas, but we were at the line so we did both anyway. I remoted into the home station on my phone, and Wyatt ran the IC-910 - 1 quick contact later we were back in the truck. Popular demand on Ping Jockey for some new ones required that we go operate from the EN13/14 line as well, plus our buddy Greg, W0LGQ needed both of them on sideband. I fired up a bit of periscope to capture our shenanigans. 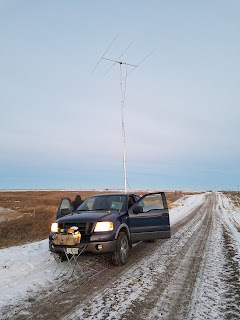 After screwing around at the corner for close to an hour (but making a ton of contacts on both Satellite and 6m) we headed back northwest again. We had plenty of time at this point, cause the next needed grids weren't until DN95 & EN05, and the next passes that looked favorable were going to be UKUBE-1 and CAS-4B, so we had time. We continued until reaching the town of Gettysburg, SD - just inside EN05 and stopped for gas and lunch at a local diner. It took a little bit to get our food, but the wait was rewarded with a darn good open face hot beef sandwich, which was the special of the day. Loaded up with beefy gravy goodness we headed north until getting out of town a ways, and found a dirt road to operate a CAS-4B pass from, right on the DN95/EN05 line. Wyatt hoisted the 6m beam and I grabbed at the Arrow. This particular section of the trip was probably the most delicate time wise - we were still 350 miles from our Motel room for the night, and if something went wrong on these passes there were no other satellite windows with EM34 for several hours. Luckily though everything worked out. W5PFG was running the KG5CCI remote like a boss and picked me up operating as K0D right away. I worked a pile on CAS-4B, and Wyatt worked a bunch on 6M from the line. After about 20 minutes we jumped back in the truck and continued north. A quick hour on the road and we crossed into North Dakota, shortly there after we crossed into DN96 and immediately turned east off the highway onto dirt roads looking for the line. 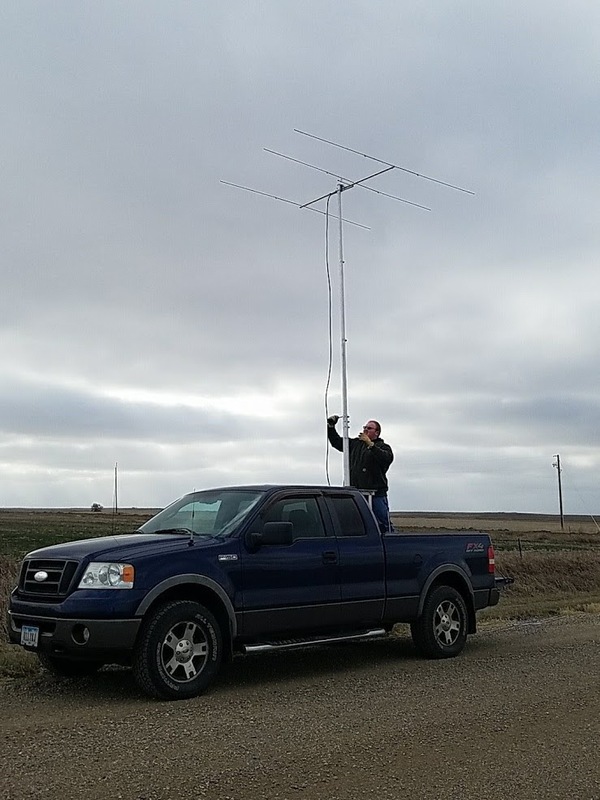 We found it just south of Hague, ND and got setup just in time for another CAS-4B pass (this one a little higher) but still in perfect position to work the entire US West to East. Once again, I jumped on the IC-910 and Wyatt ran the IC-7300 from the truck. Once again I found W5PFG running the KG5CCI remote, and knocked out 2 more in the 488 chase. North Dakota is a rover's dream land. Flat treeless expanses for miles, clear view of the horizon everywhere. We couldn't have asked for better terrain. Back in the truck again, we continued north. One more line op for the night and the hardest batch of satellite grids would be knocked out. Luckily we had many more options now for birds as the early evening brings on the 'XW Train' of Chinese Transponder Satellites, 1 by 1 for almost 3 straight hours. We wound north for almost 2 hours this time, crossing over I-94 just east of Bismark, turning east near the town of Tuttle, ND. The sun was getting lower in the sky, more snow was on the ground, and the thermometer was dropping fast... it was obvious we were getting pretty far north. We found a spot on a reasonably clear road (the initial road we had mapped was covered, and I mean *covered* in ice) and setup operations. This time W5PFG had a family commitment and couldn't run remote, so Wyatt braved the cold and ran the IC-910 on an XW-2C pass as K0D while I remoted into the KG5CCI EM34 station on my laptop from the truck. Side Note: I just want to comment on the hilarity that is technology. I was sitting in a pickup in North Dakota, speaking into into a wireless bluetooth headset, connected to my computer, which was connected to a wifi hotspot, via my cell phone, which had established a VoIP link, over the internet, to my computer in Arkansas, that was piped into a radio, which was then transmitted at a Satellite and repeated back down to a receiver, being held by a guy roughly 10ft away from me. I often struggle to explain what I do to non-hams, but on this day, I was struggling to explain what I was doing to myself. Anyway, contact was made quickly and I switched spots with Wyatt to let him warm up in the truck and work some 6m. 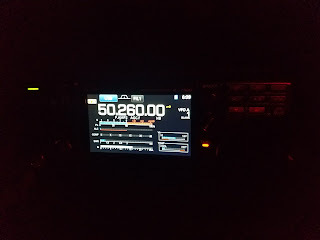 I jumped on AO-85 to give the FM only folks a chance at some rare grids - and then we packed it up and continued heading north. KG5CCI was now 7 for 13 on grids - and the most time sensitive part of the trip was over. Things were looking good. It was flipping cold. We continued to work 6M MSK144 while in motion, right into the outskirts of Minot. We found our motel for the night, and quickly unpacked. 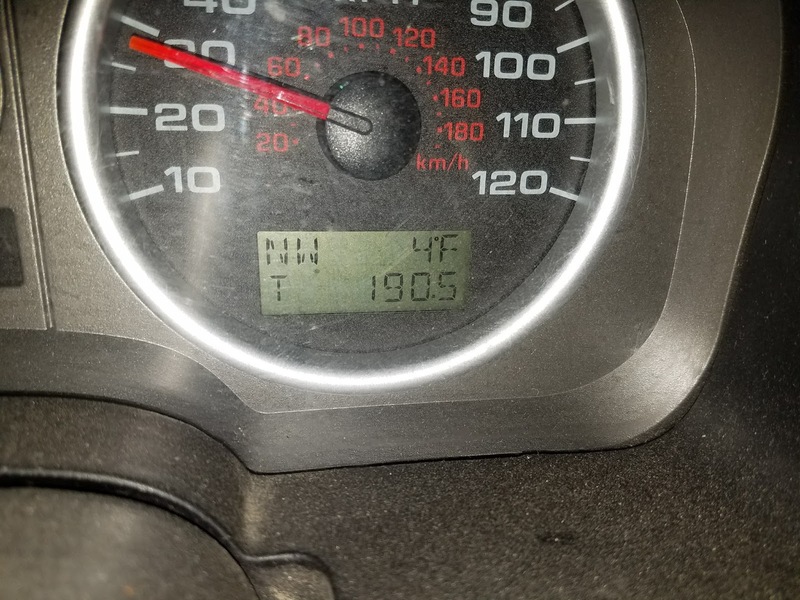 It actually had warmed up a bit - but not much. 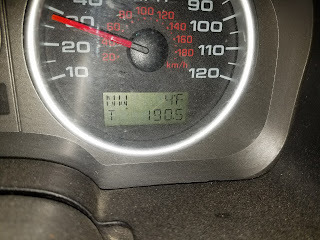 I believe it was 8°F in the parking lot of the Microtel as we were unloading our gear. I did need DN98 as well, so once again I jumped on the remote and Wyatt fired up the IC-910. This time though, things didn't go quite so well. The pass was a nice high descending FO-29 but for some reason my LinPhone Audio wouldn't connect. The bitter cold had been giving us grief on our devices, but this was something different. I ran inside to my laptop, already on the hotel wifi, but no luck there either. Something had happened to shut down the LinPhone voip proxy servers, and I couldn't connect my audio. This was the only technical failure of the trip, and it happened from a station location with good internet and warm facilities. Murphy had finally got us. I troubleshot for a while that night, but decided it was useless without the proxy server functioning. Exhausted after the drive, and having more options in the morning we made sure all the different battery powered devices were charging and called it a night. 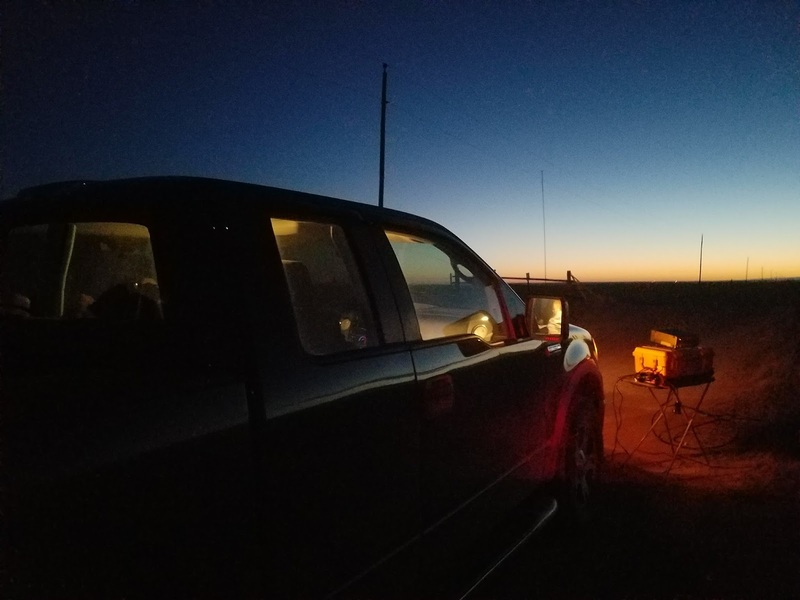 After an amazingly successful activation (I worked 21 stations on a single FO-29 pass and Wyatt worked 15 6m stations in about 30 minutes) we packed back up and begun - for the first time - going south. 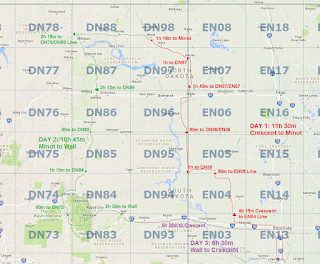 Originally we had thought about meandering over into Montana, but decided instead to shoot down to the DN77/87 line, since we were so close - and there was an SO-50 pass about 30 minutes later that we should easily be able to get too. We kind of aimlessly drove around til we got to a good spot - on what appeared to be a levee next to the Missouri River, direct south of the town of Buford, ND, and setup once again. Unfortunately the reception wasn't the best - so no periscope, but I did snap a selfie after working another ginormous pile on SO-50. With DN88, DN78, and DN77 in the bag for KG5CCI, 3 more of the 488 had gotten knocked out in a 1 hour time span. 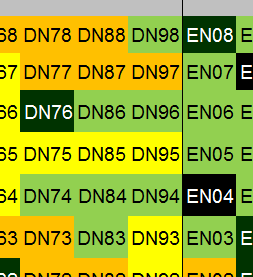 Only DN85 and DN73 remained, and those were slated for K0D activation later in the day. We packed up from the line, and continued on the levee we were on, because turning around on the ice might have proven to be a bit tricky. At the end of the levee we surprisingly (and awesomely) found ourselves at the Missouri-Yellowstone River Confluence - which was a cool treat. Wyatt did some logging and checked some email while I jumped out and snapped another selfie in front of the sign. I walked down to the river, to pay my respects to Lewis and Clark, and back on the road we went. We meandered just a bit, not knowing exactly where we were going, and ended up in the town of Fairview, MT. We needed gas, and needed food - so we found a Subway, fueled up, and decided the best bet was to go back east a ways to US85 and then south. For the next few hours we traveled south, without really a whole lot to do. And by 'not a whole lot to do' I mean we were kept busy logging, and working 6m in motion, as well as chatting on PingJockey and seeing when the passes would line up from DN85 and DN73. This was the point of the trip that it donned on me, that we'd driven over 1000 miles in the past 24 hours, and time had absolutely flown by. I've always found long trips kind of enjoyable with good company, or a good audio book - but was astonished just how far we'd gone in what seemed like the blink of an eye. A few miles after this epiphany, we did pass thru a small portion of Teddy Roosevelt National Park - and got to see a small piece of the famed 'Badlands' of North Dakota. We kept south on US85 until just north of the South Dakota line. We drove west of the highway and found a dirt road on the DN85/86 line. I didn't need DN86 for the KG5CCI 488, but we were there, and figured why not. With W5PFG manning the remote, we quickly hooked up for a contact on AO-7 and were down to 1 to go. Wyatt hoisted the 6m mast and made some good contacts there as well - including some stations far west out in Idaho - which is usually too far for both of us on Meteor Scatter. It had also warmed up significantly, and was near 50° - so we shed some of our polar gear and and repacked for 'warmer' temperatures. We got back on US85 and kept going south, finally stopping for fuel and snacks in Belle Fourche, SD. Up until this point, we hadn't quite figured out our plan for DN73. It was on the far western side of the Black Hills, and and hotel for the night was in Wall, SD about an hour East of the Black Hills. A wildcard had also been thrown at me, in the form of Nick, UA0ZGX who I had asked for a sked while I was 2000km northwest of where I normally am. The perfect AO-7 pass for him was about 2350z - while the CAS-4B that was going to be the last grid was coming over at 2352z. Working Nick wouldn't get me a new grid, but it would get me another all important DXCC entity, and it would actually complete my WAC requirements. So, we decided to aim for a spot in the Thunder Basin Grassland, northwest of Osage, WY - just inside the line of DN73. 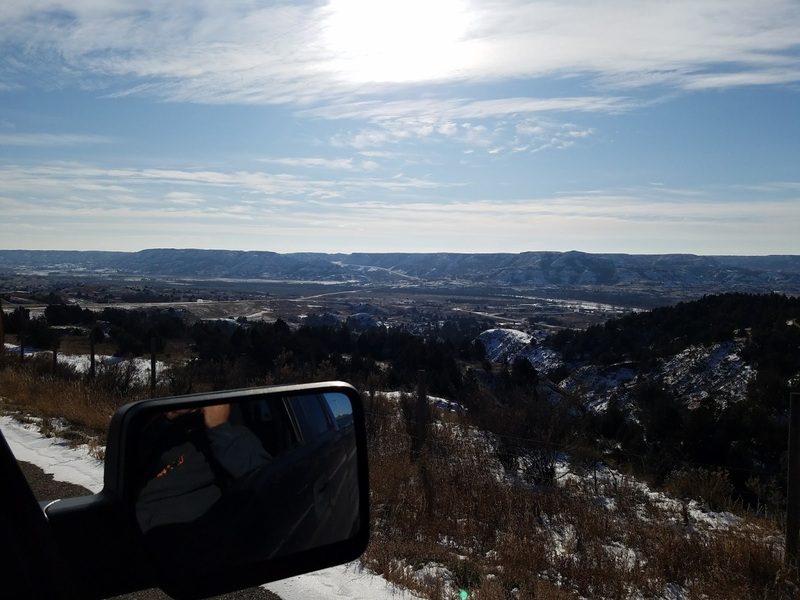 I was chancing it to find a spot with a good location, but I figured out there I'd have a much better horizon that I would back closer to the Black Hills. We navigated to the area, found a rise on a pull off on the side of the highway, and setup shop. I fired up periscope, and well, you can see for yourself (Fair warning, some not so nice language was getting used, apologies for that after the fact). We had pulled it off. 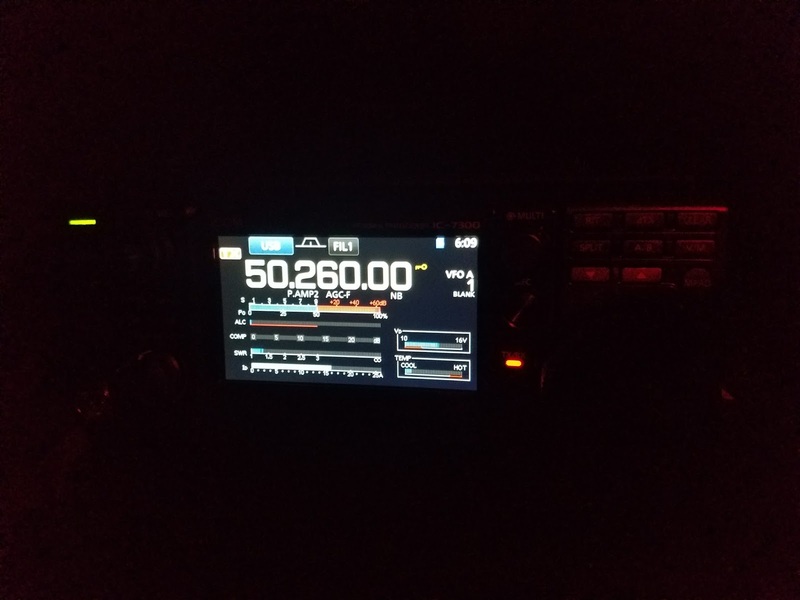 Despite from difficulties with noise, frequency coordination, and a language barrier, I had hooked up with UA0GZX as KG5CCI on AO-7, then switched over to CAS-4B, and operating as K0D worked W5PFG operating as KG5CCI from EM34, getting CONUS grid #487 in the logs from Arkansas. In retrospect, watching that live video I have to laugh at myself, but I was pretty overwhelmed at the time. In the course of about 5 minutes I had worked a new DX, completed the WAC Satellite requirements, and had gotten all but one CONUS grid in the logs. I was exhausted from driving and lack of sleep, but I was pumped full of adrenaline from the experience. 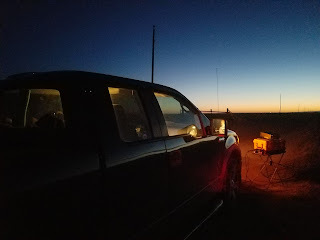 The hour or so we spent in DN73 on the side of the road was some of the funnest ham radio operating I've ever done. At the same time all this was going on, Wyatt had been working piles on 6m. We hung out for a while after the passes, since the spot was good and we were working quite a few stations. After about 30 minutes though the pings became less frequent and we decided to pack it in for the night. We had met every satellite goal for the trip - and only experienced one technical failure, which we were able to remedy without too much trouble. 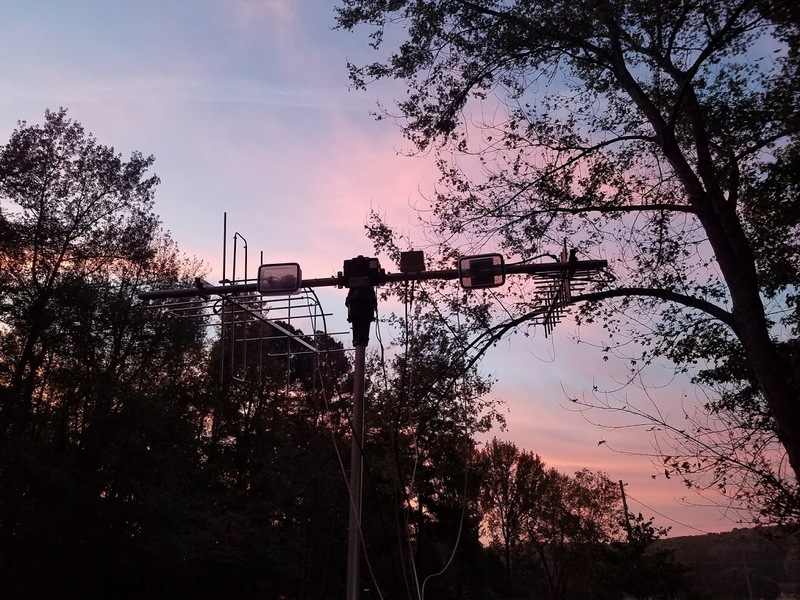 The 6m operating (while originally just a side thought) had turned out to be almost as important as the satellite fun, and there were requests for 2 more grids the next morning. We got back on the road just after dusk, and headed to Wall, SD to crash for the night. 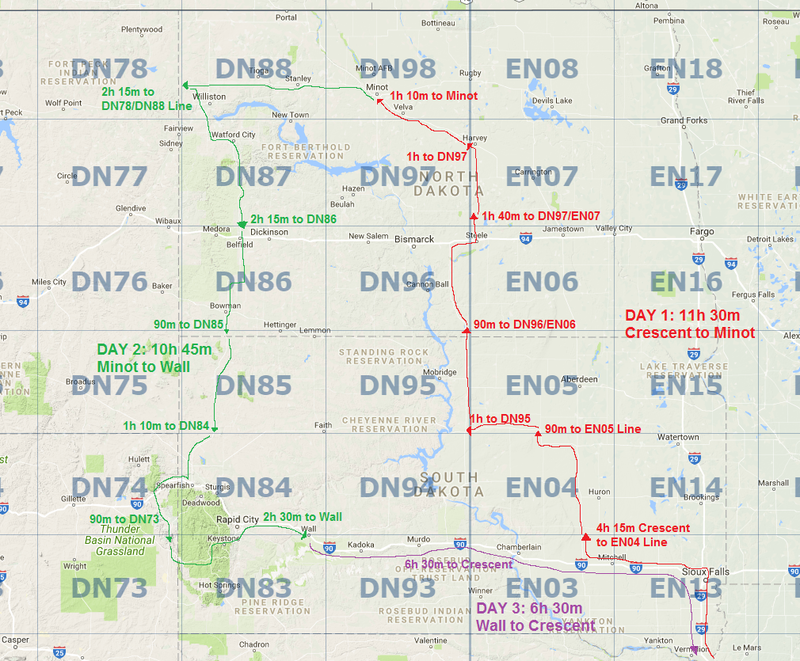 We flipped a coin to decide whether to go back to I-90 and around the north side of the Black Hills, or right thru the middle. We opted for the 'thru the middle' path - and were rewarded with a bunch of altitude ear popping and nervous deer alongside the road. It was fun to drive thru the Black Hills again, as I hadn't been there since I was a kid, but I'm not sure I'd make the same choice again after dark trying to make good time. A few hours later we rolled into Wall, found our motel and nearly collapsed. Convinced of the need for a beer after such an epic accomplishment though, we drove a short ways to a local bar, for sandwiches and cold beverages. Hardly able to keep our eyes open we finished our chow and fell down quick like upon return to the room. Part of the reason for choosing Wall as our stopping place for the night, was that it put us in perfect position to the DN83/DN93 line - which was another set of extremely rare 6m grids. With meteors being the best in the early AM, we got up at 5AM and drove the 15 minutes or so out to the line just north of the Badlands National Park. That is the picture of a happy, happy ham. Anyhoo.... about 8AM we packed up the station and started heading east again on I-90. We continued to operate in motion on the interstate, picking up a new contact about every 15-20 minutes on average. It doesn't sound like much, but when you consider we were handing out grids AND traveling 75mph down the interstate, it's really pretty amazing. Wyatt decided he needed to make 1 final stop in Mitchell, SD (not hunting the breakfast pocket from 2 days before) but instead to grab some fishing poles at Cabelas. 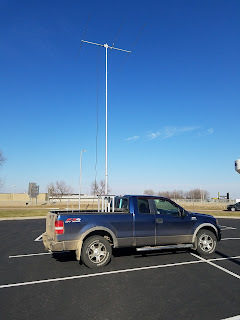 While he was inside I hoisted the mast and hung out in the parking lot making contacts, knocking out a few more 6m QSOs from EN03 that we had missed the 2 days ago on the outbound leg. 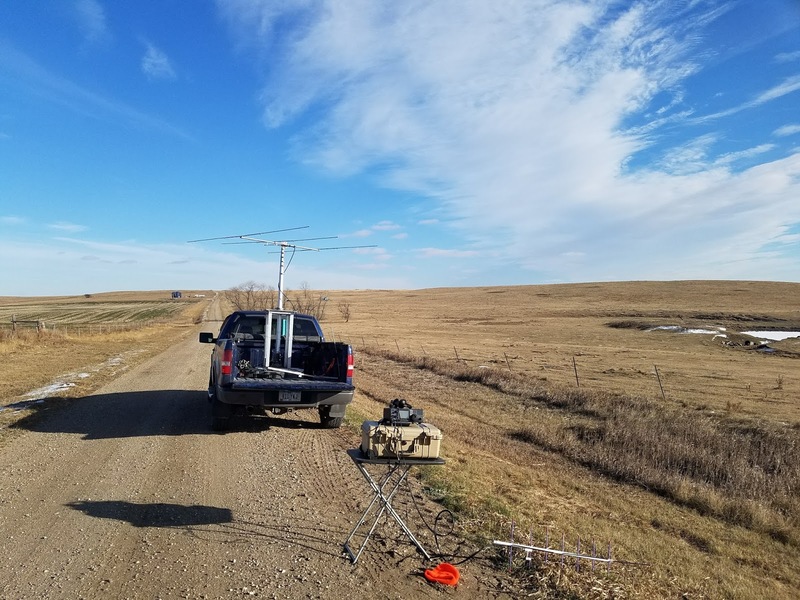 We also, by popular demand from the AMSAT crew, did an SO-50 pass to the west, working a few people that had missed the FO-29 pass a few days ago. After this, we stowed all the gear and decided to shut the RF down and take a nice mellow cruise back to EN21 and talk about the epic adventure we had just completed. Single Best Pass - 26 Contacts made on SO-50 at 1528z Nov 10th from DN87/77 line. And Here's a link to All the 6m contacts we made plotted on Google Maps. It's hard to understate how many moving parts had to come together to make this adventure work. I want to make sure to thank my folks, for letting me and Wyatt use their house to serve as our launching pad before the trip, and our crash pad after the trip, as well as watching my kiddo for a few days while I went 'off to play with radios and space stuff'. I want to thank Bill, ND0B for meeting us for the Pizza in the frozen wastelands of Harvey, ND. I want to send a big thanks Clayton, W5PFG, for running the KG5CCI remote - and for all the advice and mentoring he's given me in the AMSAT world these past few years. 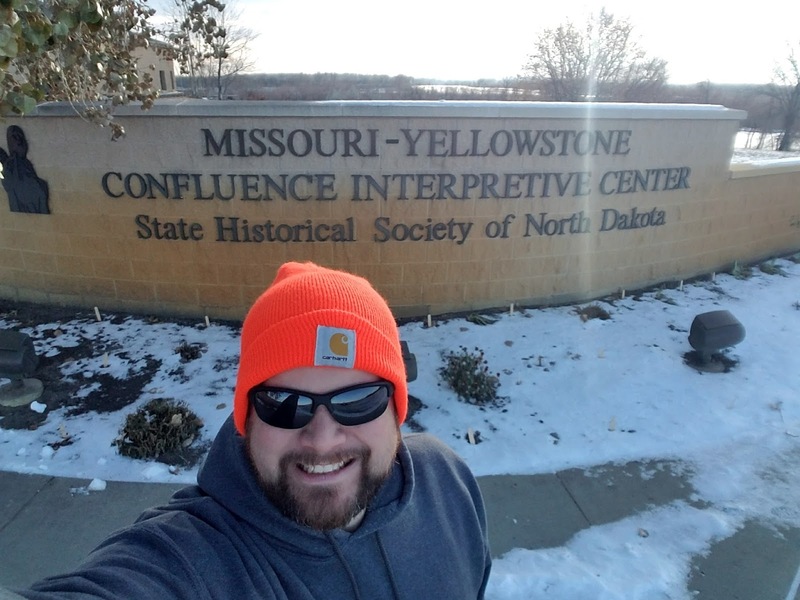 And of course I want to thank Wyatt, AC0RA, who was crazy enough to agree to a trip to North Dakota with me, in November, just to fill in a few black squares on a map. Also the use of his pickup and equipment made something possible that I just wouldn't have been able to do solo. Thanks buddy. Well, you tell me. I've got some ideas, but they're all a ways out. For now, I'm going to keep writing and keep planning. But the rover bug will never die. We'll see where the grids take me.